In a caveat-laden article in the current edition of the journal Oceanography, a trio of researchers from Rutgers and Cornell Universities argue that it's an even-money bet whether last October's "Superstorm Sandy" was caused – or at least exacerbated – by disappearing summertime Arctic sea ice. "With the increasing frequency of extreme weather events serving as a backdrop, many people are asking what role, if any, did anthropogenic climate change play in the development of Superstorm Sandy?" write the authors. "We believe that the recent record-breaking losses of Arctic sea ice may figure prominently in answering this question and in improving our understanding of Sandy's unusual nature." When describing Sandy, the term "unusual" fits it to a T. As the authors explain, Sandy began life as a rather typical late-season hurricane, but became anything but typical as it scooted northward off the east coast of the US and picked up energy from an unusally warm Atlantic Ocean. That energy, the writers contend, "helped Sandy maintain tropical storm characteristics as it headed north." 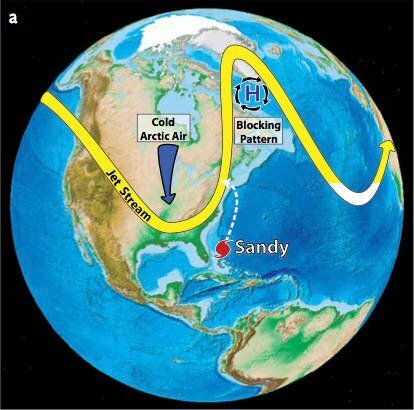 There's a good possibility that if it hadn't been for atmospheric effects engendered by the decline in Arctic sea ice, Sandy would likely have either slipped eastward off to sea or at worst merely made life wet 'n' windy for residents of Montauk or Hyannis Port. Before explaining their hypothesis that climate change may have been culpable in the Sandy scenario, the authors first review what they refer to as "the facts" of what was going on in the atmosphere at the time. First, an unusually strong high-pressure area over southern Greenland and the northwest Atlantic prevented Sandy from taking the normal northward route followed by late-season hurricanes. "Rather," they write, "Sandy did something never observed before in records going back to 1851 – it took a sharp turn to the west and headed toward the most populated area along the eastern seaboard." Fact number two: while taking this "apparently unprecedented" westward route, Sandy merged with a nascent extra-tropical cyclone of the type that New Englanders call nor'easters, thus transforming it from a late-season hurricane into a "hybrid superstorm". At its core, it had the lowest atmospheric pressures ever recorded for any storm making its way onto the US coast north of Cape Hatteras, North Carolina. The final fact that the authors cite was the extreme storm surge caused by the unlucky trifecta of Sandy's low pressure, high winds engendered by the North Atlantic block, and full-moon high tides – tides that they, of course, don't ascribe to climate change, but simply to rotten luck. "Now, some might argue that this was just a series of unfortunate events resulting from the coincidence of many rare and/or unprecedented acts of nature," they write. "For those convinced that it is very difficult or impossible to attribute the occurrence of any single extreme weather event to anthropogenic climate change, this argument is, indeed, valid." But the authors of "Superstorm Sandy: A Series of Unfortunate Events?" want those skeptical weather watchers to consider an alternative scenario, one that they assert makes a plausible argument that climate change contributed to the misery and destruction inflicted upon millions. "There is increasing evidence," they write, "that the loss of summertime Arctic sea ice due to greenhouse warming stacks the deck in favor of larger amplitude meanders in the jet stream, more frequent invasions of Arctic air masses into the middle latitudes, and more frequent blocking events of the kind that steered Sandy to the west." To bolster their claims of increasing evidence, the authors cite scholarly papers and articles on the effects of enhanced warming in high northern latitudes, Arctic air invading lower latitudes as occurred during Sandy, observations and modeling that link Arctic sea-ice loss to the possibility of extreme weather, increased snowfall linked to that sea-ice loss, and on Sandy itself – some written or contributed to by the Oceanography authors themselves. As good scientists must do when dealing with phenomena as fiendishly complex as climate – let alone weather – the authors speak in terms of probability, not certainty. With that in mind, they conclude that "if one accepts this evidence and line of reasoning, and also takes into account the record loss of Arctic sea ice this past September, then perhaps the likelihood of greenhouse warming playing a significant role in Sandy's evolution as an extra-tropical superstorm is at least as plausible as the idea that this storm was simply a freak of nature."